With the Game Of Thrones season 8 premiering yesterday, we did expect a whirlwind of memes take over the internet. But we weren't expecting to see Shah Rukh Khan's iconic line "Palat!" from Dilwale Dulhania Le Jayenge having anything to do with GOT. Someone smartly used the line during Lord Euron Greyjoy and Queen Cersei Lannister's rather amorous exchange in the first episode of Game of Thrones Season 8. Yes, we were equally intrigued and laughed out loud at this meme video. A fan re-created video of Cersei and Euron’s meeting at the King’s Landing and is now going viral, for all the funny reasons. Kit Harrington AKA Jon Snow Thought ‘This Is How It Ends’ After His Testicles Got Stuck While Filming an Important Scene in Game of Thrones 8. 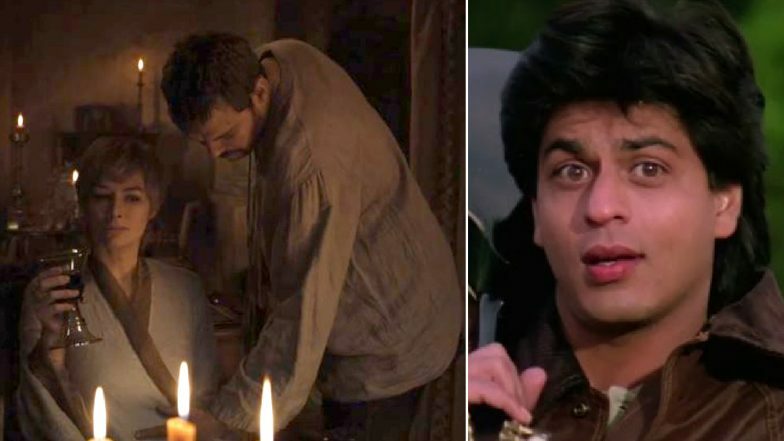 The famous "Palat, Palat, Palat" line of SRK from DDLJ has been edited onto the scene with Cersei and Euron and the video seems perfectly lip-synced. And we can't help cracking up. The eighth season of GOT premiered yesterday and is already breaking records. As per the figures released by HBO, the premiere of season 8 drew a staggering 17.4 million viewers across all platforms. The platforms include linear, HBOGO and HBO NOW. With so many wars to fight, so much of politics to play, we don’t know who will finally get to rule the seven kingdoms, but one thing is certain: There will be disastrous bloodshed!